#2: [With viewfinder] - "Jurassic Park III"
Born: 13 June 1959, Pasadena, Calif., USA, as Shelly W. Johnson. Education: Blair International Baccalaureate School [formerly Blair High School], Pasadena; Pasadena Art Center College of Design [1977-80]. 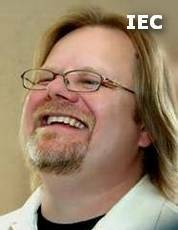 Married to author/playwright Karen Kasaba. Awards: ASC TV Award nom  for 'Everybody's Baby: The Rescue of Jessica McClure'; ASC TV Award nom  for '[Louisa May Alcott's] The Inheritance'; ASC TV Award nom  for 'The Others' [ep #5 '1112' dir by Bill Condon]. 'Jurassic Park III' : 'Two weeks after finishing work on 'The Others', Shelly Johnson received a call from producer Larry Franco, asking whether he had any interest in meeting director Joe Johnston. "I read the script for the first time while I was sitting outside Joe's office," recalls Johnson. "As I finished reading, I just stared off into space. This would be working at a scale that I had never attempted. I'd done a lot of television and eight or nine features, including a fairly large second-unit on 'True Lies', but... then the film's UPM passed by and recognized my thousand yard stare and laughed 'Shelly, you look like you just read the script.' That kind of reassured me. I wasn't the only one who reacted in this way! There would be a lot of human moments within complex action sequences containing animatronics dinosaurs as well as complicated CG elements that seemed very overwhelming. First off, Johnson got several pieces of advice. 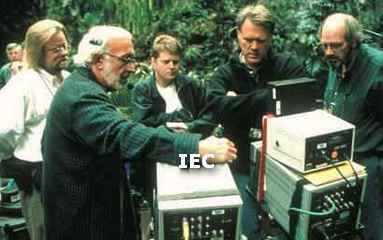 First he called upon Allen Daviau, who did extraordinary amounts of day exteriors in an on-stage jungle for 'Congo'. In watching the High-Def version of that picture, Daviau showed Johnson what he felt worked and what didn't. "We went over everything in detail and I saw how he handled the exteriors by his use of color, misters and other tools." Johnson learned from Daviau that a careful use of misters is key in creating depth. "By adding misters - highly filtered water through emitters to create a curtain of vapor - I could get a curtain that would effect only the background. This way, people could walk out of the 'depth' and create the illusion of a deeper jungle." The next piece of advice Johnson sought was from 'The Lost World: Jurassic Park' cinematographer Janusz Kaminski. "He told me that 'The creatures will give you everything you want. You need to concentrate on giving them a world that they can live in. Find an interesting way to look at their world and it will work.' I realized that since a lot of the movie is character-based, we would lose the audience if the camera was focusing on the Hollywood shot and not on what the characters were seeing." Taking their counsel to heart, Johnson struck off on his own. 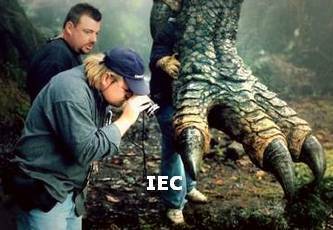 'Jurassic Park III' was to be shot in the 1:85 format, which was easier for effects as well as keeping the feeling of dinosaurs and vegetation existing together. He utilized Panavision cameras - two Platinum's and a Panavised ARRI III - with two VistaVision cameras for effects shots. His lenses were all Primos, with a lot of time spent on the 4-to-1 zoom. "When Joe starts rolling, you have to keep rolling, and just make a few little adjustments without cutting. That's why there's the zoom. We would hide the fact that we were on the zoom in the moves." The cinematographer capitalized on three Kodak stocks: EXR 5248 [100 ASA] for the Hawaii sequences; a mix of Vision 200T  and Vision 500T  in the massive jungle sets; and Vision 200T for the remaining footage. "I didn't want to shoot wide open with the big creatures, so I went for the faster stock here where I felt the need." "The film feels as though it is set in a rotting environment. There is no new growth - that is to say there are no young green colors. The plants on the island are mature and in a state of decay. So colors were important. Ed Verreaux and I worked with greens supervisor Danny Ondrieko on keeping 'young green' out of the vegetation and out of the lighting. This is a decaying island." On the jungle set, Stan Winston and crew managed to fine-tune the dinosaurs' paint job accordingly. [Far left] with dir Joe Johnston [2nd from right] - "Jurassic Park III"
Charlie Grace [pilot dir by Robert Singer] 9-part series; other ph: Richard M. Rawlings Jr. The Others [pilot dir by Mick Garris + 12 ep dir by various] 13-part series, 2000; 2uc: Richard M. Rawlings Jr.